Tidying up things in your Magento database can save more MySQL space and ultimately, a fly weight Magento DB yields better performance results. From here it will be a walk-through on how Magento database cleanup, how Magento log cleaning can be done both manually and automatically and other Magento database maintenance ideas. Here are the 3 Magento database optimization and cleanup tips that guarantee blistering page loading speeds. 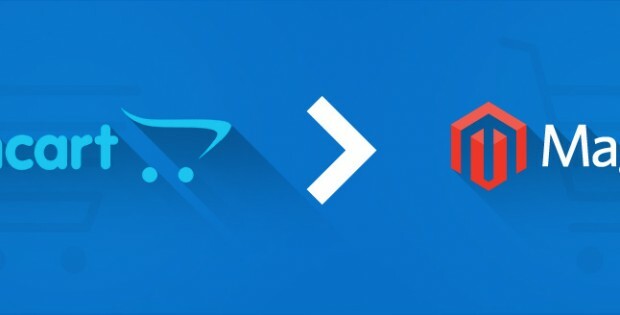 All the three practices improve magento database performance. Note: Among the three above mentioned Magento log cleaning practices, you’ll get to manage the following tables only when the cleanup is performed using Magento admin interface. Step 5: Under “Log Cleaning”, change “Enable Log Cleaning” status to ‘YES’. 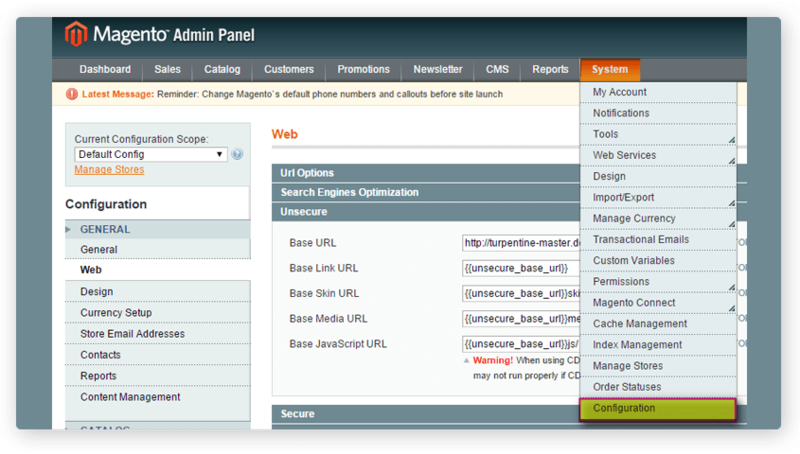 This will help you clear Magento database cache or delete Magento database cache. Magento database log cleaning by manual effort is considered as the most convenient way to clear Magento db cache by those who are familiar working with databases. Manual database optimization method is quicker as well and you’ll be able to clean any log you want. 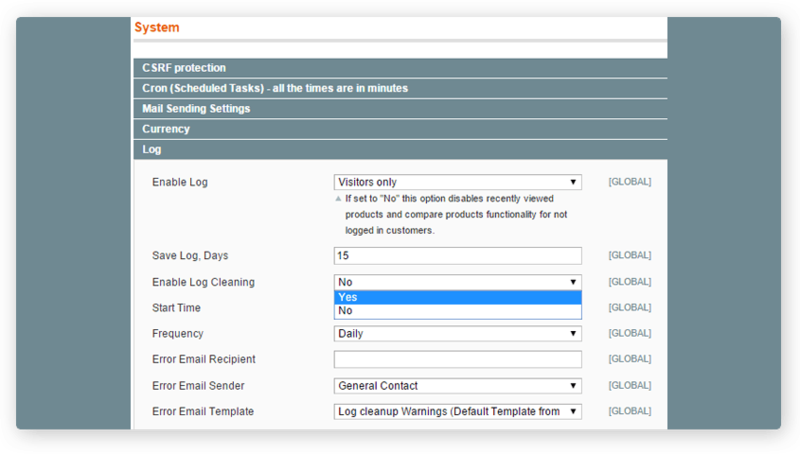 You can also clean other tables which are not included in default Magento log cleaning using manual cleaning method. This procedure drastically decreases the database size (almost up to 95%) and reduces latency of query processing. Step 2: Check the following tables available in the frame located in the right side. Step 3: Scroll to the bottom. Select the ‘With Selected’ drop down menu and click Empty. Click Yes in the confirmation pop up that appears. 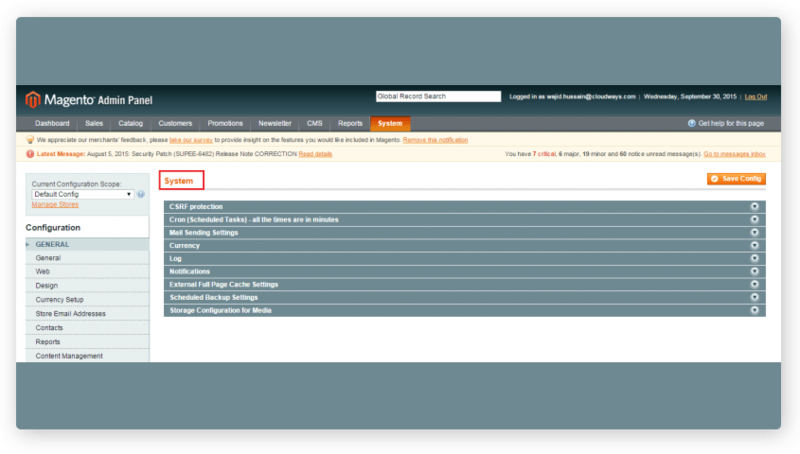 Step 4: Scroll to the top of the page and click the ‘Structure’ tab. Step 5: Now repeat step 2 by selecting the same tables you selected previously. Go to ‘With Selected’ drop down menu and click ‘Optimize’. That’s it! Magento system log cleaning is done. 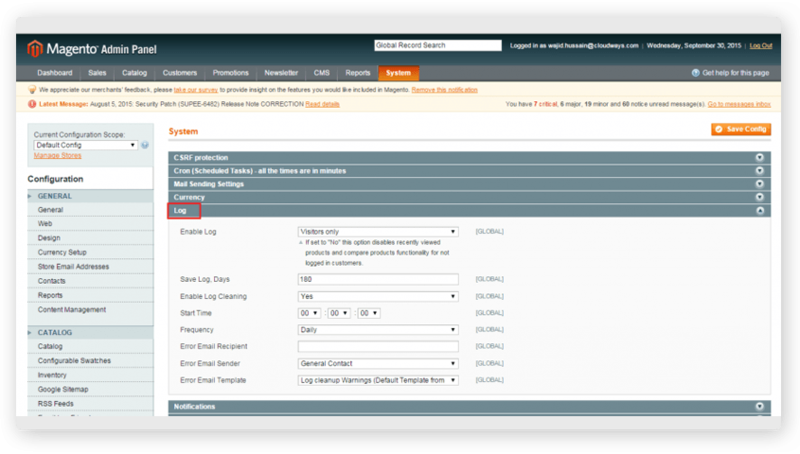 Magento enable log cleaning can be done using the log.php file within the Magento /shell folder. 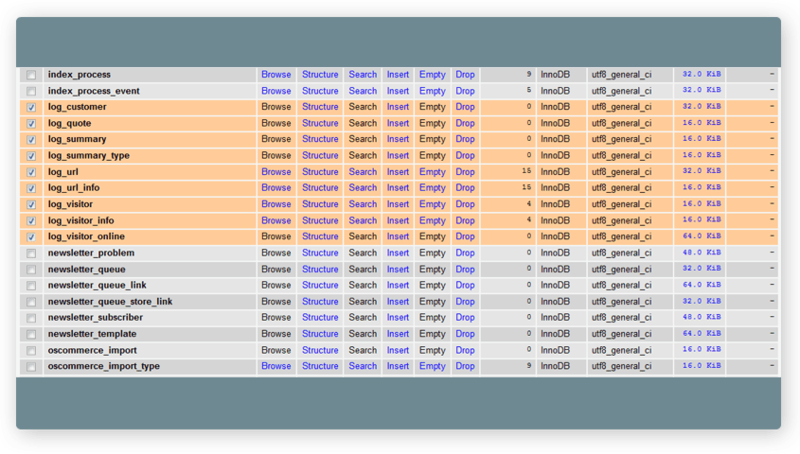 The Magento database logs cleaning can be run manually or through a cron job. Step 2: Use the “–days” to mention the number of days of history to be saved. Yet another simple but often overlooked method of Magento database cleanup is updating the MySQL version. Regular updates are being rolled on and as a website owner, it is your job to keep in track of the Magento version you are using and the appropriate MySQL database version. This is an indirect way which will help to improve Magento database performance. Older versions of MySQL database for a newer version of Magento CE (Community Edition) or EE (Enterprise Edition) is obviously going to be less efficient in Magento database maintenance. Magento CE 1.9.1 and Magento EE 1.14.1 support MySQL versions 5.0.2 through 5.6.x. Magento CE versions 1.8.0.0–1.9.0.x support MySQL versions 4.1.20–5.5.x. 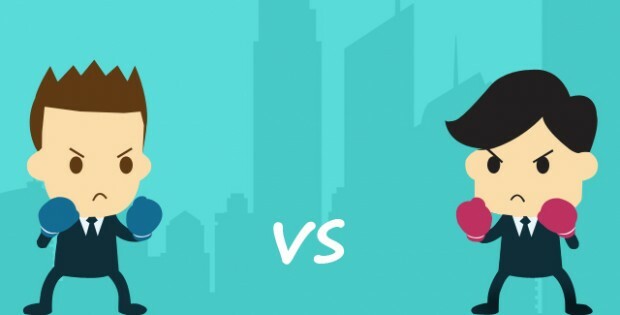 Note: The system prerequisites for Magento CE and EE are different. One of the first and foremost things to do in Magento database optimization using MySQL performance tuning is to optimize the innodb_buffer_pool_size. Though this is not helpful to clear Magento database, it indirectly helps in achieving better Magento database performance. The purpose of innodb_buffer_pool_size is that, it caches the data and indexes happening in a website. So, having the buffer pool size as large as possible will save disk space by using memory for a majority of read operations. 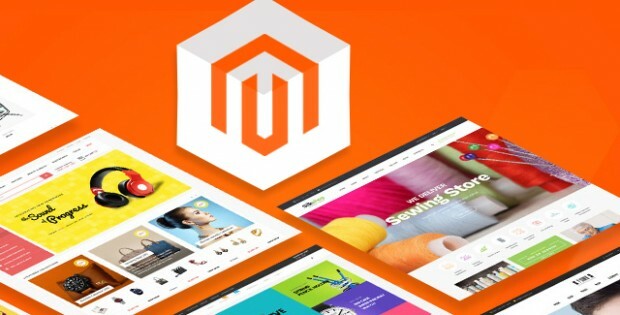 Expert thought: We have experienced Magento databases getting reduced by quarter of their size after performing the above mentioned Magento Database Maintenance ideas. We recommend you to perform such operations on a regular basis to achieve blistering loading speeds. 10 Comments on "​​Magento Database Maintenance & Optimization By Log Cleaning For Better Performance"
There are many things Magento does well, but database management isn’t one of them. Over the last couple of days I’ve searching for magento database maintenance and this post is clearly explained about magento database log cleaning. Thanks for your informative post. Magento maintains several log systems for tracking purpose like customer access, products viewed, products compared etc. This article explained clearly on how to perform magento database by log cleaning. Good information. Thanks. Hi Masi, I read this article about maintaining and cleaning old Magento cache and log records. It’ll greatly improve Magento database performance. Very often Magento database grows big in size due to large log tables and it might be a good idea to regularly perform a maintenance clean up. Its really fantastic tips about magento database maintenance and the Innodb part is news to me. Good collective tips on magento database log cleaning. Thanks Masi. Magento is highly stable eCommerce system but it’s database is not as efficient as it should be. So I highly recommend, Whoever need magento database maintenance, this blog is a handy one. It has lessened my concerns about magento database log cleaning. Thank You. Keep it up. Hi I am getting magento database errors like “Too many connections”? How can I resolve it?